STB works with Prepar3d v4.4. I use the latest releases of STB and Prepar3d 4.4 and UTlive. But the time given in STB are ??:?? is this correct? Then something else: after a period of time using Prepar3d 4.4 with STB and UTlive, i see a name of a carrier with a aircraft type. Pressing on it, a different aircraft type is showing up. For example STB displays KLM b737 and looking at it, it's a complete different aircraft type and not KLM anymore. How come? STB works with Prepar3d v4.4. I use the latest releases of STB and Prepar3d 4.4 and UTlive. But the time given in STB are ??:?? is this correct? Then something else: after a period of time using Prepar3d 4.4 with STB and UTlive, i see a name of a carrier with a aircraft type. Pressing on it, a different aircraft type is showing up. For example STB displays KLM b737 and looking at it, it's a complete different aircraft type and not KLM anymore. How come? These have a different code path and I've not known them to fail. Good time to visit, who knows what will happen after March but it's not going to be good if carries on like this. 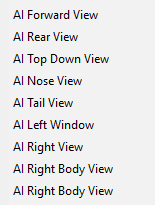 The views you refer to are part of what we cann "Enhanced View AI", and this is something that LM implemented very well in SimConnect for Prepar3D. The observer based views (from runway, parking, etc) and very good also, and "flyby" is just outstanding!